When you have braces, it’s very important you know how to properly floss and brush your teeth. You should floss and brush after every meal in order to keep your teeth and gums healthy throughout your treatment. If you can’t floss or brush your teeth after each meal, sneak away and swish your mouth with water. While this isn’t as effective as brushing, it can help wash away food particles that could cause plaque buildup. If you need help choosing the right toothbrush, toothpaste, and dental floss, please ask us and we can help you choose the right products for your teeth and your appliance. 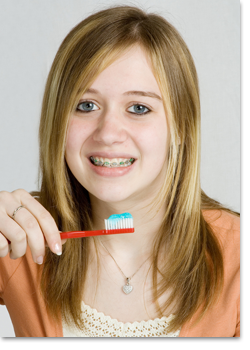 Follow these instructions on how to properly floss and brush your teeth with braces. For brushing, these 4 steps will show you the right way to do it. Follow these steps for how to properly floss and brush your teeth. For flossing, follow these 4 steps.